Yesterday I received in the mail one! CS5! software disc! of my own! 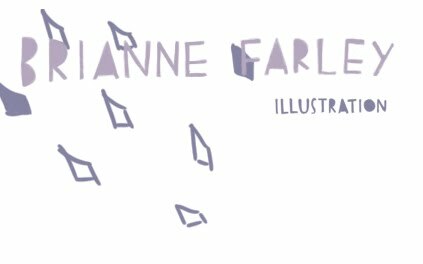 This is after an awful week in which a deadline for an illustration for my dream publishing house intersected with the unexpected end of my free Photoshop trial. Long story. Suffice it to say that it ended semi-triumphantly in the General Access Lab of SAIC (How did I get in without an ID? Magic?) where I scanned a gouache illustration painted on screen printing paper. Some paper-lover out there is reading this and a tear is trickling down his or her cheek. GOUACHE ON SCREEN PRINT PAPER? Ayeyaiyaiyai. So my Photoshop arrived the day after my deadline and I wanted to make out with it and throw it across the room at the same time. However I did neither. 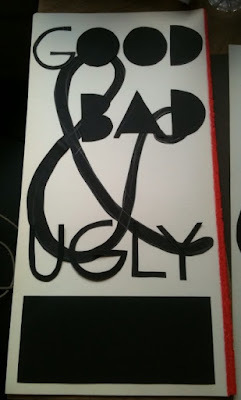 I just decided to do my next poster--it's for an upcoming SCAD Illustration gallery show at Desotorow called "The Good, The Bad, and The Ugly"--by hand. Here are my supplies! 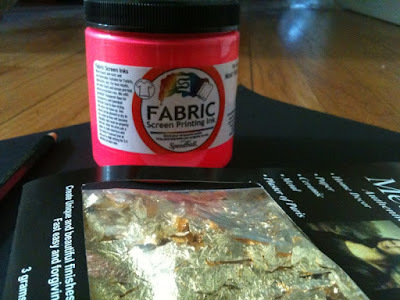 Black paper, an X-acto knife, bitchin fluorescent pink ink (hm wait, that's for a different project) and gold leaf. More on that later. You can make a screen print from a stencil in a couple of different ways. For this project, I'm gong to lay the black paper right on the light table, lay the screen on top of it, and expose it that way. You can also secure the black paper to clear sticky paper and then expose, or you can even just adhere cut sticky paper right to the screen and bypass black paper and photo emulsion all together. These are the two layouts I came up with. The text will be printed with a purple-y ink, and the ampersand will be printed on top with a very translucent sea foam green. 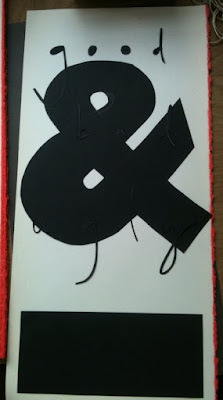 Then, I'm going to lay gold leaf flecks on the ampersand while the ink is still wet. I've never tried this before--fingers crossed. The block on the bottom will contain the gallery and artist info...which I'm using Photoshop to layout! Noooo, I failed, I used Photoshop. But listen there are 16 artists showing and I want the info to be legible. If you're going to be in Savannah, come and see the show. Me too! This show is going to be rad.